Pitt Engineering researchers study potential benefits in co-treating Pennsylvania's acid mine drainage and shale gas wastewater. Pennsylvania’s energy history is rich with the quantities of fossil fuels that it has produced, but is also rife with the environmental legacies of coal mining and, more recently, hydrofracturing. Water that finds its way into abandoned coal mines dotted throughout the Commonwealth resurfaces as acid mine drainage (AMD), while freshwater used to fracture or “frack” oil and natural gas deposits reemerges as “produced” water contaminated with salts, metals, and radioactive material. 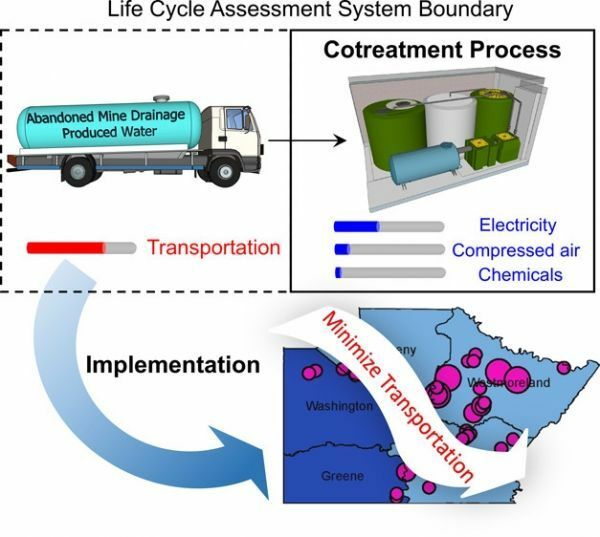 Leanne Gilbertson, assistant professor of civil and environmental engineering, is principal investigator of the research, “Life Cycle Impact and Benefit Tradeoffs of a Produced Water and Abandoned Mine Drainage Co-Treatment Process” (DOI: 10.1021/acs.est.8b03773). The article, authored by graduate student Yan Wang, incorporates related research by her Swanson School colleagues, Radisav Vidic, the William Kepler Whiteford Professor and Department Chair of Civil and Environmental Engineering, and Associate Professor Vikas Khanna.